Rochester, NY - Semrock has broken new ground with the release of the new VersaChrome™ tunable bandpass filter family. VersaChrome filters offer wavelength tunability over a very wide range of wavelengths by adjusting the angle of incidence with essentially no change in spectral performance. With a tuning range of greater than 12% of the normal-incidence wavelength only five filters are needed to cover the full visible spectrum. 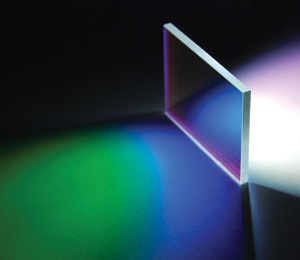 VersaChrome tunable filters ensure top performance with an average transmission greater than 90% across the bandwidth along with the center wavelength tuning flexibility of a diffraction grating. The complete set covers wavelengths from 390 – 700 nm. Parts are immediately available from stock in 25.2 x 35.6 x 2.0 mm sizes, and custom sizing may be done within one week. Ideal for fluorescence microscopy, imaging, and quantitation applications, as well as hyperspectral imaging, high-throughput spectroscopy and fiber-optic telecommunications systems that can benefit from the spectral and two-dimensional imaging performance of thin-film filters. Because of their excellent polarization insensitivity and high optical quality and damage threshold, they are well-suited for a wide range of laser applications as well. "At the heart of this invention is Semrock's discovery of a way to make very steep edge filters at very high angles of incidence with essentially no polarization splitting and nearly equal edge steepness for both polarizations of light," said Turan Erdogan, Chief Technical Officer. Catalog products ordered by noon, EST will be shipped same-day. Rapid custom-sizing is shipped in under a week and a 30-day no-hassle return policy applies to all catalog products. All Semrock filters are covered under the company's five-year warranty.